How versatile are the Osgiliath ruins? I was thinking of picking up the triple pack while they are in stock, but I have never really seen anyone take multiple copies and make each look different - my google image search would lead me to believe that most people only buy one set or scratch build their own. They're fantastic. Easy to convert and are massive and impressive. I own six... or maybe seven. Plan on using them for any Gondor related ruin, including the battle at Pelargir. This is what stops me from getting in to LOTR - the pricing is all over the place. Why is Theoden, an all plastic kit, £20, when Eomer is £4.40 less, and similar models £3.30 less? Maybe its just me - I mean, if you only need a box or two and a blister then I suppose its not bad - but then... its never just a box and blister is it? It's Forge World, so i'm not entirely sure what else you would expect. Théoden is new and all in plastic and so priced as a modern mini. Eomer is a metal/plastic hybrid and nearly 20 years old, so doesn't really command the same price anymore. As above. The pricing is as 'all over the place' as any other range if you ignore the distinction between who makes the models and the context behind their creation. I actually thought the prices of the hero characters by FW would be higher than they are. Given it's up to £22 for resin/metal foot/mounted character packs, some of which contain quite old sculpts (Gandalf the Grey on foot is a 17 year old one), then £20 for two on foot characters isn't too terrible. I suppose technically the like for like comparison are the metal dual character packs though currently at £12.30. But the quality here is far superior. As above. The pricing is as 'all over the place' as any other range if you are unaware of the distinction between who makes the models and the context behind their creation. Probably because the plastic 2018 Theoden kit is far, far superior to the old 2002 Eomer metal figure on a plastic horse. You need exactly the number of models as the scenarios or armies you want to play. I find it highly suspect that New Plastic Theoden is what is stopping you from playing Middle-earth Strategy Battle Game. Inquisitor Gideon wrote: It's Forge World, so i'm not entirely sure what else you would expect. Elevenses wrote: I actually thought the prices of the hero characters by FW would be higher than they are. New Plastic Theoden is not Forge World; neither are any of the items available from the Games Workshop website or other new plastic releases (Gandalf and Pippin). Only the resin models on the Forge World site are released by Forge World. Join us on Warhammer Live from 4PM (GMT) for the Middle-earth Takeover, then rounding out the day with a battle between the forces of Gondor and Mordor! Most importantly they're gonna talk about Gondor at War! Well dang... and not a day after I finish painting the original metals of those three! Might have to get those, as I was really impressed by the plastic Theoden in BoPF. Nice minis. I wonder though - will we get a new release of the rest of The Fellowship when GW decided to refresh these 3 heroes? I feel like that Legolas face paint job has a lot of meme potential. Love all the stuff announced. I really like the Quick Reference sheet. Hope that's got what you can spend Might/Will/Fate on. As has been said by GW before, they are working through the movies (in no order) and refreshing the whole line. This may include just re-releasing old models, or it may include releasing brand new ones - such as Denethor/Gandalf/The Three Hunters etc. But they aren't doing it randomly, they are all tied to an event or specific time in the movie. In this case, its the Pelennor Fields and wider Gondor conflict first. That's why we've seen a ton of new Gondorian releases along with Gandalf and Pippin in his Gondor gear. These Three Hunters are perfect for leading the Army of the Dead charge. I fully expect a new Eowyn with Merry, much the same as the Gandalf with Pippin set, but I can't see a completely brand new 9-man Fellowship box unless GW decide to go way back to the start. They may well do that, of course. But just understand that its all tied to whatever specific chronological event is being covered at present. Frodo and Sam I guess could work since they were at Osgiliath, Boromir would only work in so far as he would be a flashback model of his armoured self before he went to Rivendell. In any case, it wouldn't be an entire box set of the entire group. Ultimately, we just don't know! I'll be honest, of all of the older ranges from GW, has there ever been one less in need of a re-vamp? These new ones are nice, but the old Perry sculpts are still bloody lovely. And I like that they're minimalistic, rather than heroic-Warhammer-y, it proves a nice contrast to everything GW releases elsewhere being turned up to 11. I'm sure they could have put some new packaging on the sculpts, released them as sets or whatever alongside a new campaign, and they would have done very well. Sounds like that's what will be happening with quite a few of the existing models. 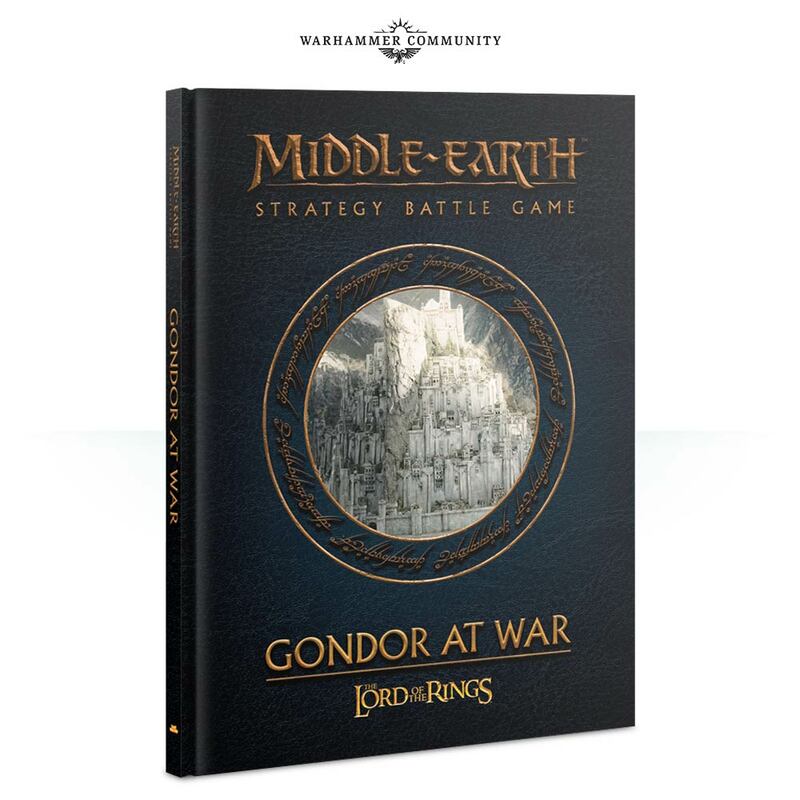 In Middle-earth, you’ll be able to play through the battle between Minas Tirith and Mordor with the new expansion, Gondor at War. This tome contains 29 narrative play scenarios, complete with a detailed campaign system. In addition, you’ll find rules for new Heroes, an in-depth look at the armies that fought in these battles, and Legendary Legions – iconic armies from the War of the Ring such as the Rangers of Ithilien or the Army of Gothmog. Using these themed forces will feel like you’re playing out a piece of Middle-earth history on the tabletop! 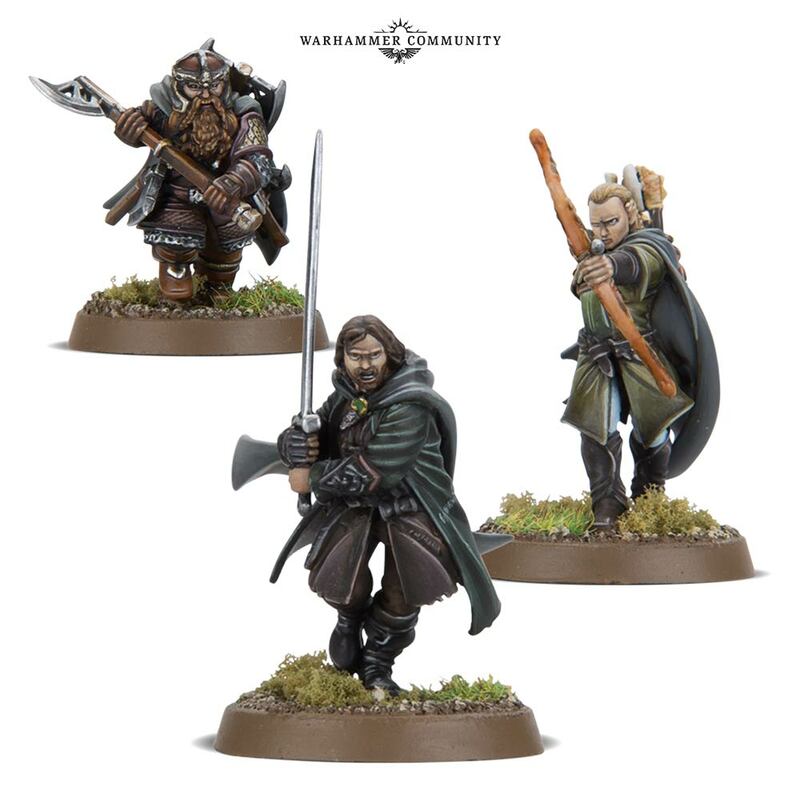 You’ll also be able to reinforce your Good armies with a trio of new plastic miniatures for The Three Hunters – Aragorn, Legolas and Gimli as they appeared at the Pelennor. 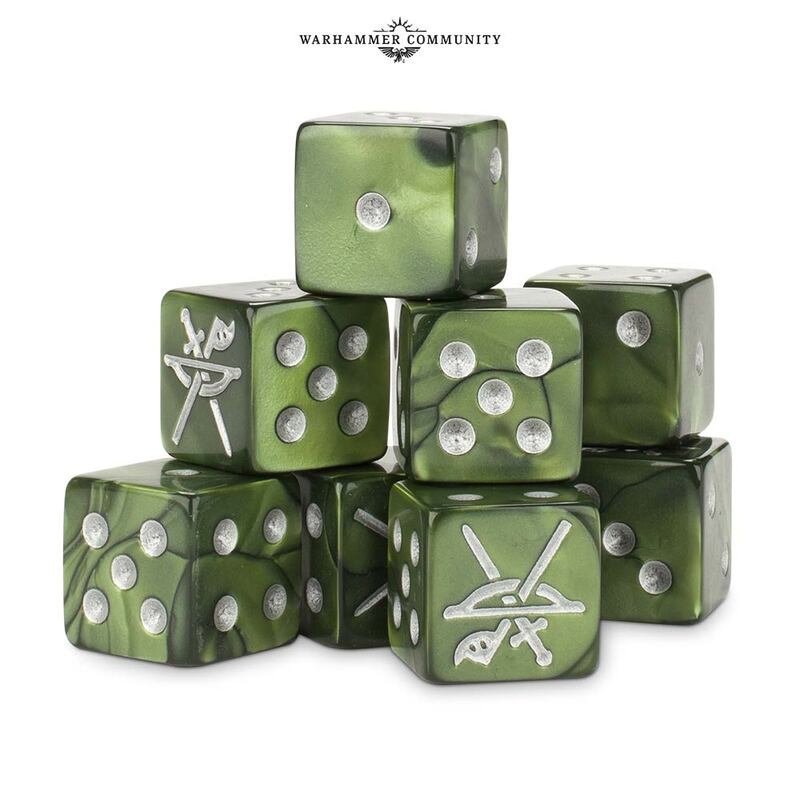 Also available will be a set of Three Hunters dice, each with a striking symbol of the trio’s weapons replacing the six. 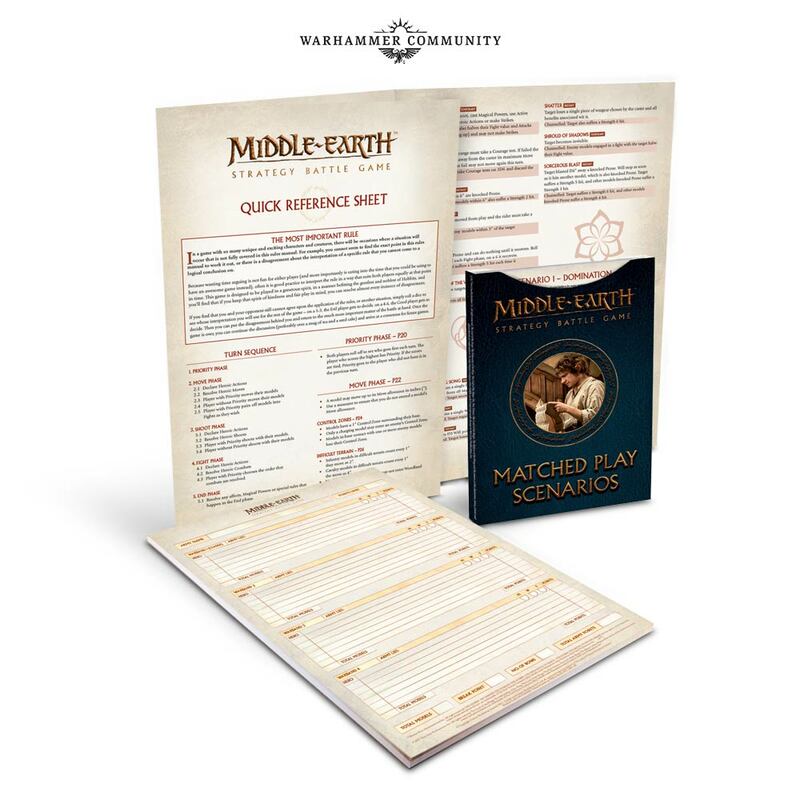 Finally, the Middle-earth General’s Accessories Pack is an essential collection of aids for all players, including a warband roster pad, a fold-out core rules sheet and a range of handy tokens and measuring devices to speed up your games. Interesting to see Dernhelm get a profile and nice to see some more evil characters coming. Should be some nice FW releases soon. Can't wait to pick it up. 29 Narrative scenarios? That's what LOTR SBG, IMO, is best for.